Just weeks after being acquired by comedian turned producer Byron Allen for $300 million, The Weather Channel has tapped augmented reality studio The Future Group to integrate immersive augmented reality experiences into its broadcast content. Augmented reality made its live broadcast debut for The Weather Channel in 2015. The technology helps on-air talent at the network to explain the science behind weather phenomena and tell more immersive stories. 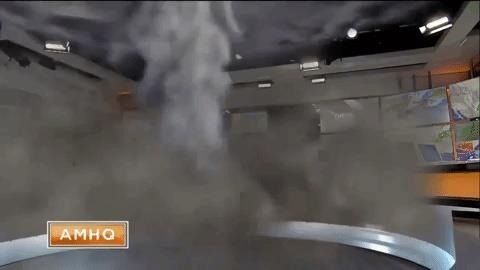 Powered by Unreal Engine, The Future Group's Frontier platform will enable The Weather Channel to be able to show even more realistic AR content, such as accurately rendered storms and detailed cityscapes, all in real time. Concept image of the AR broadcasts from The Weather Channel & The Future Group. Image via Epic Games, Inc.
"Using The Future Group's Frontier, powered by Unreal Engine, for weather broadcasting has never been done before. We are excited to continue our investment in the latest technologies that are not just cutting-edge, but on the bleeding edge of design and science." The Future Group's Lost in Time (see video below), billed as "the world's first interactive mixed reality TV show," offers a taste of what the broadcasts will look like. Launched in Norway in 2017, Lost in Time combines gaming with reality TV, immersing participants in virtual scenes typically reserved for big-budget Hollywood blockbusters. "TFG's Frontier enhances the amazing capabilities of Epic's Unreal Engine specifically for broadcast and we are very excited to be pushing the creative boundaries of real-time mixed reality for TV with the Weather Group and Epic," said Lawrence Jones, head of North America Operations for The Future Group. With tech-powered cord-cutting gaining in popularity, broadcast TV has been facing new threats to its business model in much the same way as the publishing industry has been forced to adapt to the rise of online news versus print. In recent months, both industries have looked to augmented reality as a means to enhance their respective original content in a way that adds enough value to bring paying customers back into the fold. While publishers are using mobile AR apps to embed animated experiences into news articles, television is an even more visually-focused medium, making the integration of AR a frictionless transition that doesn't require downloaded apps or additional hardware. It could be that, soon, networks like The Weather Channel will be the leading platforms that help mainstream consumers become even more accustomed to the notion of AR graphics in nearly every environment in our daily lives. Cover image via Epic Games, Inc.